Police have reportedly been asked to investigate allegations he sexually assaulted two staff members. 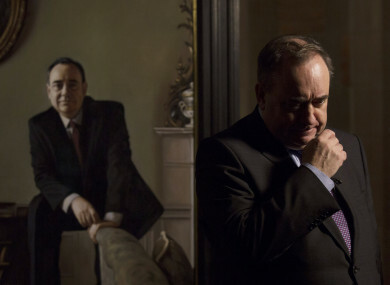 Alex Salmond at the unveiling of a portrait of himself in 2016. ALEX SALMOND, THE former Scottish First Minister, has denied allegations of sexual misconduct and is taking legal action against the Scottish government over its handling of the complaints. Police have reportedly been asked to investigate allegations he sexually assaulted two staff members at the first minister’s official residence at Bute House in Edinburgh, according to the Daily Record newspaper. The matter was passed on to the police by Scottish government officials following an internal probe, the paper said. Police would not say whether there was an ongoing criminal inquiry, but Salmond confirmed he has launched civil proceedings against the Scottish government over the internal investigation. Speaking to AFP, Salmond denied the allegations made against him. “I am not guilty of the complaints that have been made against me, and I have never engaged in criminality,” he said. In a statement, the Scottish National Party veteran went on to say that the complaints, which reportedly date back to 2013 when he was first minister of Scotland, are “patently ridiculous”. This is a procedure so unjust that even now I have not been allowed to see and therefore to properly challenge the case against me. I have not been allowed to see the evidence. I have tried everything, including offers of conciliation, mediation and legal arbitration to resolve these matters both properly and amicably. This would have been in everybody’s interests, particularly those of the two complainants. All of these efforts have been rejected. The Permanent Secretary chose to deny me contact with any current civil servant, many of whom wished to give evidence on my behalf and access to documentation to allow me to properly challenge the complaints, all of which I refute and some of which were patently ridiculous. The procedure as put into operation by the Permanent Secretary is grossly unfair and therefore inevitably will lead to prejudicial outcomes. It is therefore with great reluctance that I have today (Thursday, August 23) launched a Judicial Review in the Court of Session which will decide the issue of the lawfulness of the procedure which has been used against me. If I lose then I will have to answer to the complaints both comprehensively and publicly. Until then I am bound to say nothing which would impinge on the Court proceedings. In our submissions on Judicial Review we have asked that the complainants’ identity be protected If the Court of Session finds in my favour then the administration at the senior levels of the Scottish Government will have the most serious questions to answer. In my opinion and for whatever reason the Permanent Secretary has decided to mount a process against me using an unlawful procedure which she herself introduced. I will let a real court decide whether it was lawful for her to do so. A statement from First Minister Nicola Sturgeon said that she has no role in the process but said that her government would “defend its position vigorously”. She said the complaints “could not be ignored or swept under the carpet”. She said she was aware the allegations would be upsetting for her party, but that the “over-riding priority must be to ensure fair and due process”. “Last November, I agreed with the First Minister that, in light of wider concerns about harassment in Westminster and the Scottish Parliament, an internal review would be carried out into the Scottish Government’s procedures for handling complaints in the workplace. As part of that review, a new procedure on handling harassment complaints involving current or former ministers was introduced. “Following the conclusion of an internal investigation I can confirm that the Scottish Government received two complaints in January in relation to Alex Salmond. Mr Salmond was notified of the complaints in March and the details of the procedure under which the complaints would be addressed. I informed Mr Salmond and the people involved on Wednesday, August 22 of my conclusions and that I was considering the public interest in making the fact of the complaints and investigation publicly known. Salmond took Scotland to the brink of independence in 2014 as leader of the SNP. He served as an MP for Gordon until 2017. Email “Former Scottish First Minister Alex Salmond denies allegations of sexual misconduct”. Feedback on “Former Scottish First Minister Alex Salmond denies allegations of sexual misconduct”.